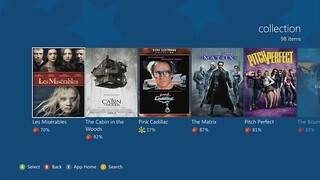 One of the most popular apps for movies is now on Xbox LIVE. Today, Flixster* is available for Xbox LIVE subscribers in the U.S., bringing your favorite Flixster features to your TV. Flixster lets you buy and rent thousands of popular movies, check out show times at your local theater and access the latest fresh or rotten movie scores from Rotten Tomatoes. The Flixster app also gives you access to your UltraViolet movie collection on your Xbox. Download the application for free from the Xbox LIVE marketplace now and get watching! *Xbox LIVE Gold subscription and/or additional subscriptions/fees may be required and sold separately. For additional details and availability, see http://www.xbox.com/live.